Paramount Miami Worldcenter now has Federal Aviation Administration approval to start construction. The FAA approved the 55-story Paramount to be built up to a height of 699-feet above ground level, or 709-feet above sea level. 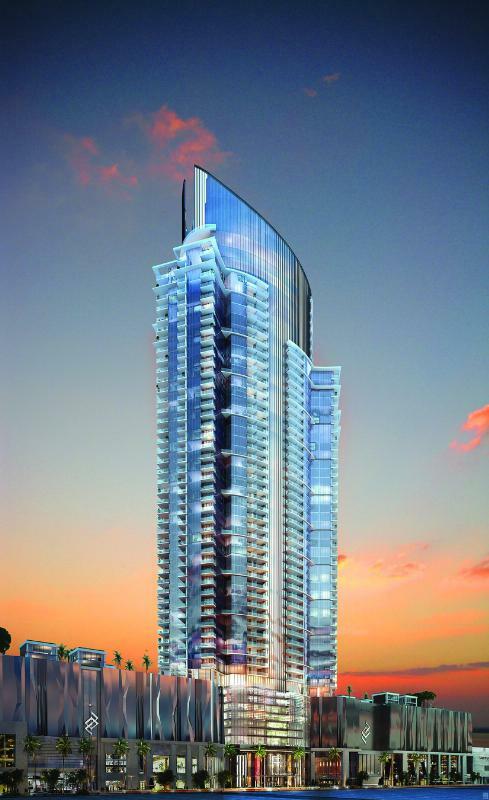 That would put it at a similar height to existing nearby towers, such as Marquis at 1100 Biscayne Boulevard. Paramount will include 470 units. Residents will enjoy private elevators, and will have direct 3rd floor access to The Mall at Miami Worldcenter. Elkus Manfredi is the project architect, and Daniel Kodsi, Art Falcone and Nitin Motwani are the developers. Construction is expected to begin the second quarter. The FAA also granted approval this week to Michael Simkins, who submitted plans to build a 647-foot tower (634-feet above ground) at 85 Northwest 10th Street, a few blocks west of Paramount. Niiiiice. Love the design, something different from the usual balcony boxes we get for the most part down here. Okay, the usual “foamers at the mouth” can resume your attacks on this project. Amazing design. Amazing Amenities and Features. Hopefully they sell. Anything for a buck. Yeah, let’s import a bunch of Chinese from their ghost cities to live in ours. A buck from a ghost is still a buck. They are called “ghost cities” because there are no people in them. How would you be importing people from cities without people? 90% of “anonymous” comments are patently idiotic, yours is certainly included. Wow! Simply beautiful! Along with 1000 Museum, these 2 buildings will stick out like 2 super models. This is one beautiful building. Too bad they have canceled another two on top of the mall, now it’ll look too small for a giant, mostly empty pedestal. cool can’t wait to see even more Aventura-type 90s-style tower on a giant shopping-garage stuff downtown. Miami’s not a joke, nah. Well aceraroja, we have been patiently waiting for the unvailing of your development plans for downtown Miami…what are you waiting for? Are you calling this building “Aventura-type 90s-style tower”? Do people even think before writing stuff anymore? I know it’s fustrating XVS, but remember, it say’s here you can leave a comment, it doesn’t say anything about “thinking” before you do it. Good point. aceraroja must be a believer that thinking is overrated. Posting something sensical would make him groggy and tired. Way off – I’m thinking more of 2010 Wuhan monstrosity. LOL. Why stop there and not compare this building to Burj Dubai? Why would someone pay MORE to buy here vs paying LESS un Brickell or Midtown?? Maybe because this will be the center of Miami in 5 years? And maybe it’s a block away from 2 museums, museum park, a performance art center, aaa arena, and private elevator direct access to the mall, direct access to 8th street promenade, 3 blocks of amenities, 2 floors of more amenities, 2 blocks away from Miami central station, 2 people mover stations. 5 mins away from Miami beach, 5 mins away from brickell, 5 mins away from midtown. I never knew so many Miamians lacked foresight and real estate common sense till I’ve visited this site. Have fun living in your little bubble. “Foresight” and “bubble” – that’s what will stop people from paying more to live there than in Brickell. You wouldn’t know “foresight” if “foresight” hit you on a head. Miami is still dirt cheap, $700/sq ft in fully-delivered (not decorator ready) top notch building in one of America’s most beautiful and glamorous cities does not a bubble make. Easy friend. I’ll believe the hype when they put out sales figures. I’m sure you’re aware that high-end luxury condo sales are down 8.7% from last year. These buyers certainly are not going to be coming from Brazil or Venezuela or Russia. It still maybe dirt-cheap to a New Yorker, but even with a little investigation, they know the risk that this development is facing. It fell apart once, and we ain’t talkin’bout lightening here. I doubt it Kristian. Miami World Center is proposed to contain at least twenty spots in it – bars, restaurants, clubs – where liquor will be sold. Even you would be enticed to live in a spot like that with the honies flowing in and out like the waves on an ocean. Maybe because once the construction is over this area will be just as good as Brickell and better than Midtown, with superior access to just anywhere you’d like to go (Beach, airport, I-95)?